As a first time visitor to Art Basel Switzerland, I had many pre-conceived notions and expectations. 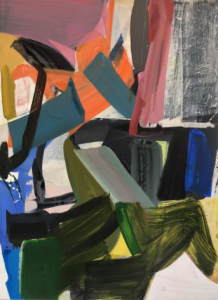 After all, Art Basel is the King and Queen of all art fairs rolled into one—the fair after which all others model themselves. Taking over the Messeplatz, the exhibition and trade center in the heart of the city, this 49th edition of the fair was comprised of 290 booths occupied by top international galleries, with blue chip galleries occupying the ground floor and younger galleries on the second level. While big sales by mega galleries dominate the art press (this year the buzz was about the two Joan Mitchells that sold for 14 million each) each fairgoer creates their own narrative thread, choosing their favorite items with which to pose for selfies and share with friends. While seeking out new and unfamiliar artists, there’s always a tendency to land on the tried and true. For me these included Jonas Wood, featured with both David Kordansky Gallery and Anton Kern Gallery; Amy Sillman, represented by a gorgeous trio of small abstractions at the London and Paris based Campoli Presti; Marian Adams Strange Bird at Salon 94, NY, and Kerry James Marshall Vignette (The Kiss) at Jack Shainman Gallery, NY. New finds were Mario Garcia Torres’ patinated bronze sculptures, at Galleria Franco Noero, Torino, crafted to appear as crumpled cardboard, and Pae White’s Bugz + Drugs, Command –J at NY-based Kaufmann Repetto. The UNLIMITED section, a curated hall of installations, was sheer fun—part museum, part amusement park, part public installation, I had the feeling of being outdoors while indoors, a function of the monumentality of many of the exhibits. 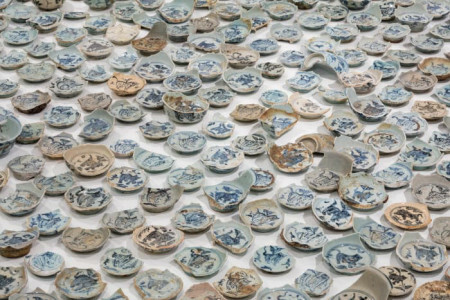 Among my favorites were Ai Weiwei’s Tiger, Tiger, Tiger (2015), an installation of 3,020 porcelain shards of ancient Chinese pottery from the Ming Dynasty, placed in neat rows on the floor, by Lisson Gallery, NY; Old Man Yu Gong Is Still Moving Away Mountains (2017), a mammoth painting by Chinese artist Yu Hong from Long March Space, Beijing, a parable of sorts showing man scaling a mountain side, a reflection of community working together to triumph over nature. Lee Ufan’s Relatum (Iron Field), curated by PACE Gallery, NY, offered a bed of sand punctuated by hundreds of steel wires sticking up vertically, evoking sea or sand grass. While I experienced a deep sense of serenity and calm, initially, a longer look invoked fear, as the sea of sharp metal conjured weaponry or a battlefield. In that moment, I was once again reminded of why we seek out art. 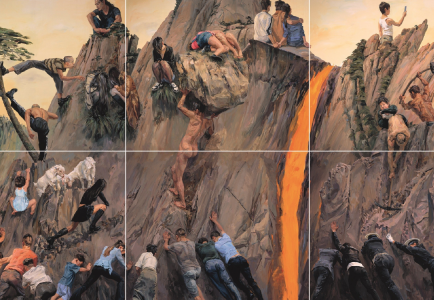 It tests, surprises and provokes with its irony, tension and underlying subtle meanings. Yu Hong, Old Man Yu Going Is Still Moving Away Mountains (2017), Acrylic on canvas, 196.9 x 354.3 in. 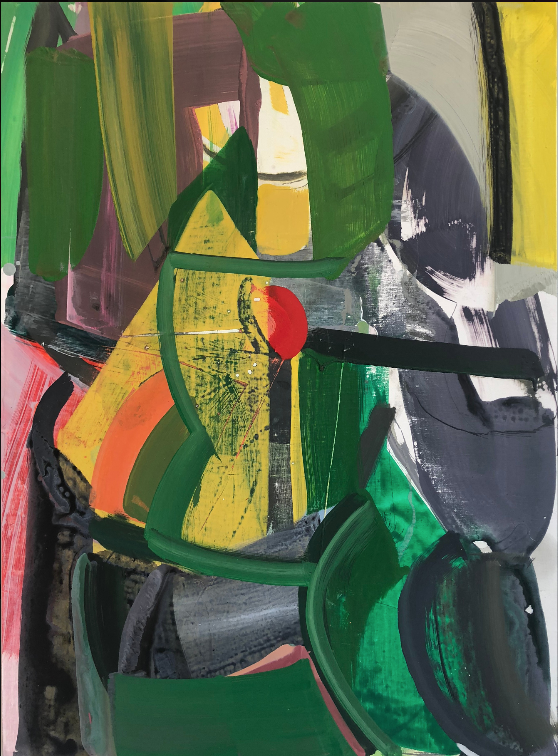 Amy Sillman, S14 (2018), Acrylic on linen mounted on panel, 30 x 22 in. Amy Sillman, S16 (2018), Acrylic on linen mounted on panel, 30 x 22 in.